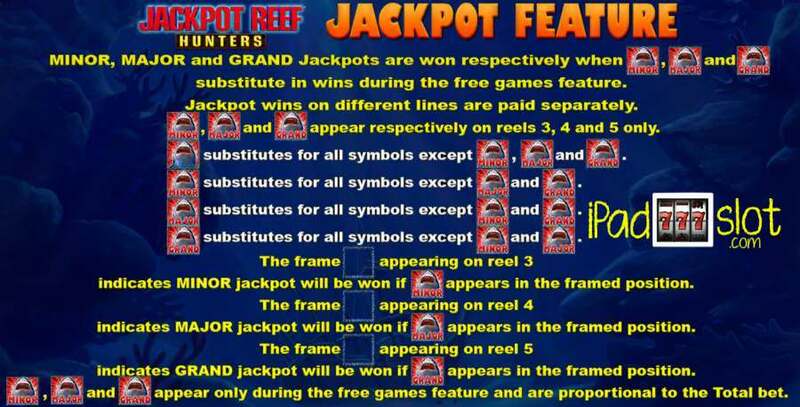 Jackpot Reef Hunters is an online slot machine from Aristocrat comes with an aquatic theme. Instead of fishing for dinner, players in this slot game will be fishing for cash prizes or just some free coins depending on the version that you play. To start one’s undersea themed adventure in this progressive slot game players need to do is to set in motion the game’s five reels that come with 5 paylines. 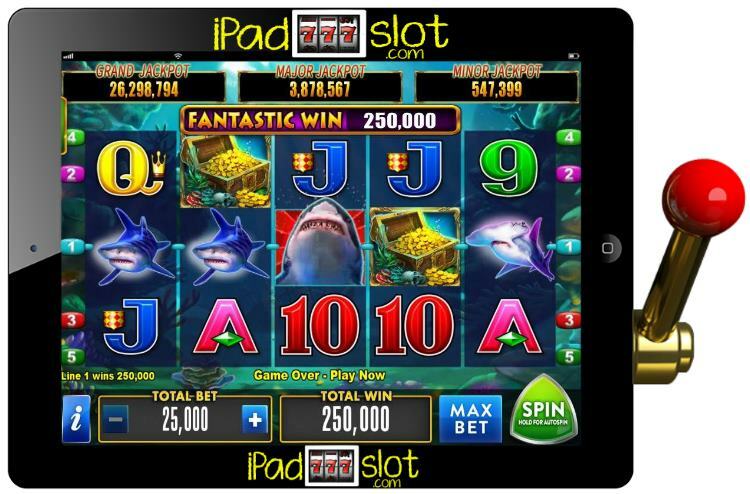 Jackpot Reef Hunters is mobile friendly meaning that players are able to enjoy the game on their mobile devices like iPad, Samsung, iPhone, provided they run on Android or iOS. If like ocean themed slots you might want to check out the Novomatic Dolphins Pearl game. The background of this slot game depicts the ocean underground. The reel section is a bit transparent meaning that players will be able to see the background graphics as they spin the reels. 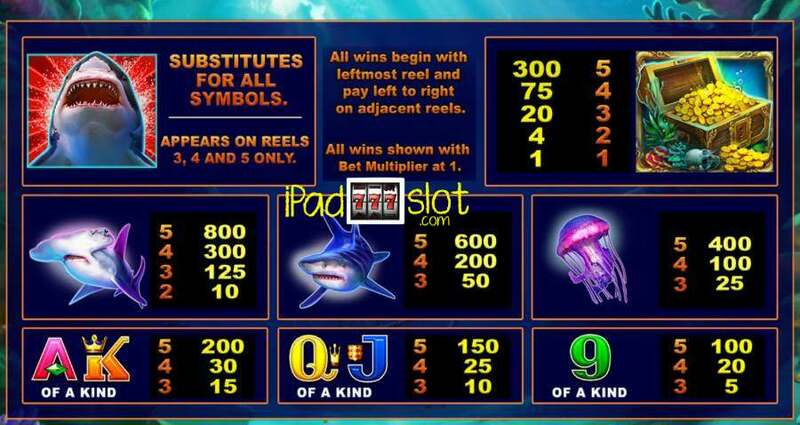 When spinning Jackpot Reef Hunters’ reels, players will find the following symbols on the reels: dolphin, shark, octopus, treasure chest and traditional card symbols. Dolphin: The highest paying icon in this game is the dolphin. For matching five of these the player is awarded 800 credits, for matching four of these the player is awarded 300 credits, for matching three of these the player is awarded 125 credits and for matching just two the player is awarded 10 credits. Shark: The second highest paying symbol in this game is the shark. For matching five of these the player wins 600 credits, for matching four of these the player wins 200 credits and for matching three of these the player wins 50 credits. Octopus: The third highest paying symbol in the game is the octopus. For matching five of these the player wins 400 credits, for matching four of these the player wins 100 credits and for matching three of these the player wins 25 credits. Treasure Chest: The fourth highest paying symbol in this game is the treasure chest. For matching five of these the player wins 300 credits, for matching four of these the player wins 75 credits, for matching three of these the player wins 20 credits, for matching two of these the player wins 4 credits and for landing just one the player wins 1 credit. Traditional Card Symbols: These symbols are the lowest paying in this online slot machine. For matching five of a kind the player wins up to 200 credits, for matching four of a kind the player wins up to 30 credits and for matching three of a kind the player wins up to 15 credits. Wild: The dolphin acts as the wild symbol. Scatter: The scatter symbol in this game is represented by the treasure chest. This feature is triggered when the player lands at least three scatter symbols. The player initially receives 7 free games. All wins in this feature receive a 2x, 3x or a 5x multiplier. Landing three wild symbols which substitute for any other icon in completing a winning combination on the same spin will help the player to trigger the Jackpot Feature. In this feature, the player can hit any one of the game’s three progressive jackpots. To win the Minor Jackpot, the wild on reel three has to be highlighted by a blue colour. To win the Major Jackpot, the wild on reel four has to be highlighted by a blue colour. To win the Grand Jackpot, the wild on reel five has to be highlighted by a blue colour.